Gaisebaba, Christian Afrofusion artiste, who recently broke the internet with his thoughts on virginity and abstinence, has served us something hot early in the year. 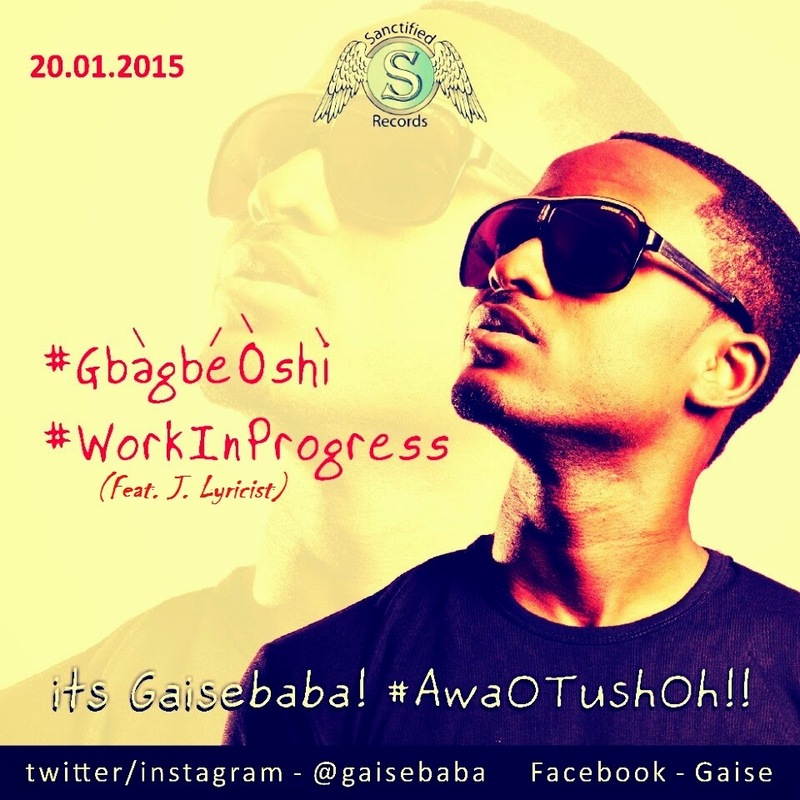 He returns with two massive new singles titled, “Gbagbe Oshi” and “Work In Progress” featuring J. Lyricist. Both tunes are produced by fast rising producer Okey Sokay. Gbagbe Oshi, mixed by Olaitan Dada (Natialo productions) is an inspirational jam!! Laced with heavy percussion, and live talking drum, it emphasizes Gaise’s style, to serve up a rich groovy beat. Gaise has indeed mastered the art of serenading our ears with refreshingly witty rhymes, which we have come to love him for, and he again delivers on this one. Gbagbe Oshi is one song that will definitely get parties rocking this year. Okey Sokay’s soft chords, coupled with Gaise’s sweet vocals, and J. Lyricist’s soft melodic rap make this a timeless, spirit and soul-lifting song, any day, any time. Gaise is an Afrofusion artiste who uses conscious yet entertaining music to influence society and promote positive values. Educated in King’s College Lagos and Obafemi Awolowo University Ile-Ife, the second-class upper Economics graduate ventured into professional music in 2010 right after completing the Nigerian National Youth Service program. GaiseBaba, his debut album was released in August 2011 under the label Sanctified Records. The album introduced Gaise unto the Music scene as a lyrically sound writer with predominantly Yoruba lyrics, and a unique style of delivery that appeals to all generations. He has been described by many as a ‘fresh breath’ in the Nigerian Music Industry. The album was accompanied by a video for its lead single “follow follow” which was nominated for theBest Indigenous Concept at the Nigerian Music Video Awards 2011, and Best Video at the Africa Entertainment Awards 2012 in Malaysia. Gaise was awarded ‘New Revelation’ at The Scepters 2011, and ‘Best New Artiste’ at the premier edition of Crystal Awards in 2013. With a rapidly growing fan base, particularly in the South-Western parts of Nigeria, he has headlined shows and performed on stages some of which are the 2011 Ekiti Mega Fiesta, where he performed alongside 2face Idibia and Sasha, Felabration 2011, CoolFM Praise Jam 2011, RCCG National Youth Conventon, MFM National Youth Convention, Hip Hop World Awards Nominees’ party 2012, InspirationFM Praise Jam 2012, PremierFM Ibadan 10thanniversary celebrations, Pepsi Campus Tour, GLO LafftaFest Ado-Ekiti 2012, Ondo State YouGoFest 2012, Crystal Awards 2013, Bloggers’ Symposium with Gov Kayode Fayemi 2014, Lagos State Sallah Celebrations 2014, Afropolitan Vibes (felabration edition) 2014 alongside highlife maestro Etubom Rex Lawson, Dr. Myles & Ruth Munroe’s Memorial service in Lagos 2014, and Lagos State Christmas Carol 2014. In October 2013, he was the youngest of fourteen (14) eminent entertainment and arts practitioners honoured by the Ekiti State Government as Cultural Ambassadors.